Cover Love at Romance Lives Forever is a short intro to a book and includes a cover, blurb, buy links, and social media contacts for the author. 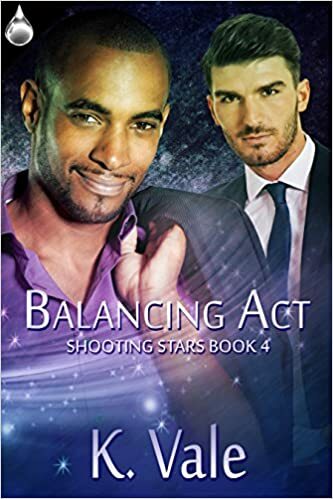 Today's featured book is Balancing Act: Shooting Stars Book 4 by K Vale. K. Vale delivers a hot read in Balancing Act: Greg Dwyer and Kyrie Li are living the glorious couple life in New York City. Or are they? When struggling actor Kyrie lands a modeling job, he’s ecstatic to have extra cash to spend on his best-friend-turned-boyfriend. Can Greg find a way to stand up to Mommy Dearest and win back a love he fought so hard to reach? He discovers the road to pride begins at home and with accepting oneself first. Otherwise, it’s just a dead-end street. Book 4 in the Shooting Stars series. Yo, Kimber. :) LOL Welcome to RLF!